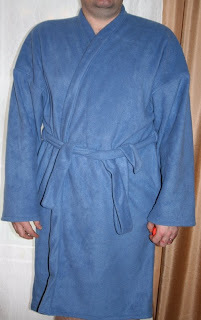 Sew Can Do: Christmas Gifts, After Holiday Shenanigans, Misc. Christmas Gifts, After Holiday Shenanigans, Misc. Thanks to a massive windstorm we were without power and camped out at my parents house for the past 24hrs. No offense to my parents, who were wonderful hosts, but it feels good to be home. It was only a short time, but wow do we feel behind. We were literally in the middle of a bunch of chores, a taken apart car & home improvement things when it went out, so we'll have to play catch up the next few days. I was planning on having my latest recycled sewing project finished and posted, but for now it's half done. This assortment was from Chris. I've felt like I didn't have enough spatial-relation skills to make my own designs, but would really like to break out of cookie cutter patterns, so these books seem very handy for facilitating that. 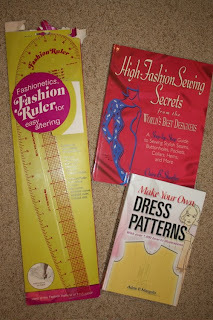 The interesting fashion ruler tool was a surprise item for both of us - when he went to look for wrapping paper in our closet, he found this (which was my grandmothers). It's specifically for making your own design alterations for tricky angles like sleeves and other curves, so it was truly serendipitous. He also got me the adorable, felt play food patterns that were on my want-to-get list. Thanks to some Joann's gift cards from my sisters, I got all the felt I needed today and am eager to try those out. I really hope they turn out, since I have some ideas for some of my own designs. With the new year almost here, I'm been resolved to being more organized with our housework, to-do home improvements & homeschool stuff. I'm regularly asked how I find time to make all my projects and the truth is I've let most of my usual house cleaning and overall organizing go. A lot. I've been falling into the ignore the mess or shove it in a cupboard routine and am a bit sick of it, since I used to be ridiculously neat. So, after having some success organizing my sewing stuff and our overcrowded kitchen cupboards, I am using my newfound determination to get our house shipshape, come up with some fun, stimulating 2009 homeschool plans and still designate some time for my crafts that doesn't involve microwave dinners and treating our cabinets like they're clown cars. I am so impressed with all of your Christmas sewing! I've been SO lazy about checking blogs so I can't believe you have TWELVE new posts since I last looked!! I love your little hedgehog labels! I'm so glad those worked out for you too.